Thanks for reporting your results with the Vive. They are very much aligned with similar rigs with the Rift. This demonstrate that they perform equally good. For the SS, I put your results in another tab in the same sheet. Try to put SS=3 or SS=4 to see how much affects performance and increase graphics quality. Thanks for running the test. I think that your CPU is clearly the bottleneck, since your RAM and GPU are in the Top of the Top range. Try to run the Passmark benchmark (https://www.passmark.com/download/pt_download.htm ) and see what CPU mark and Singlethread numbers do you obtain. The 3930K is a very good CPU but with low speed clocks. You will need to do overcloking if you want to increase your performance. Thanks Chili for the info and feedback as well as putting this together. That's up just over 15 fps avg from no overclock but still well below the mid 80 average for this hardware I think. 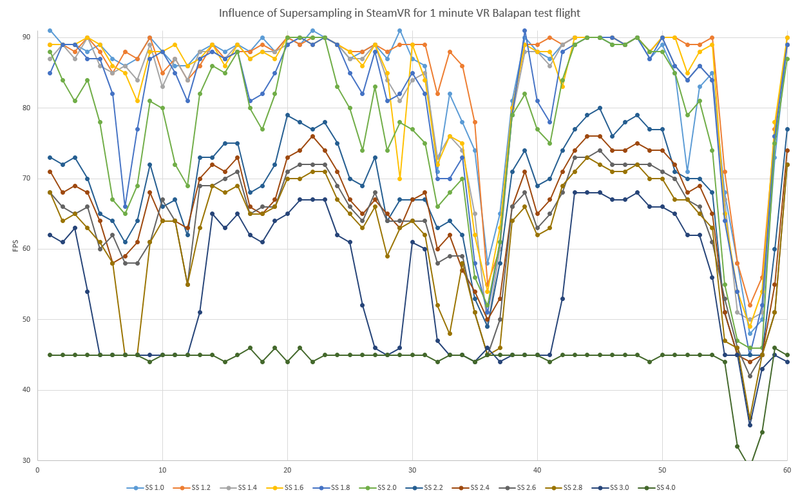 In steamVR setting I'm using a 1.7 supersampling if I turn it down to 1 I average 88 fps, are we sure everyone is running 1.7 SS? Just making sure before I start chasing frames. Unfortunately no current hardware can handle stable 90fps in heavy fights and even in offline track. It is unlikely that I will change a 144Hz monitor to VR until stable 90fps online. But IL-2 project is going forward and I am sure IL-2 devs would do some optimizations bearing in mind that for the last 4 generations of CPUs there wasn't any significant improvements in single thread performance. Does fullscreen option affect FPS in VR? Also it is interesting how much FPS (or percents) can a user gain if switching to lower graphic options. I personally prefer more FPS to a nicer picture. Thanks for reporting your tests with OC. It definitely helps. The ST is 2361 and the avg is 65.396, this is very much aligned with the correlation graph below. You can put your mouse over your blue dot (the pair 2361-65.396) and you will see you are almost in the line. So it is a consistent result. Edit: Well, I see that your recorded 63638ms, that is 63.638 seconds, more than 1 minute. You need to configure Fraps to record just 1 minute (said in the procedure). This could be the reason for your inconsistent results with more overcloking (4.7). This CPU should do the trick together with the optimized moscow map in the next patch. I only play online and while I'm usually not very sensitive to the artifacts asw produces, online it's a different story. I absolutely need to know if that radial engine thing that zoomed past below me over a forest was an la5 or fw. Asw on makes that difficult. With the 7700k @4.8 asw is rarely an issue in a fight. However when lined up on the ground and a squad of bombers is trying to land it will dip down to 45 and stay there, even with hud off, so no there's not much headroom. Still, overall I'd say performance is excellent. And with a good cooler 4.8ghz is a very conservative oc for the 7700k. I only run 1.25v, temps are low and could probably go lower on voltage if I had the patience for more stability testing. Many thanks for running the benchmark with the 970, it will be important to many who are considering upgrading their GPU. Also modified in my original post to avoid any confusion. New RAM arrives any day now, will see how it goes. Uhmm! the single thread number seems too high for not doing Overcloking (ie runnning at 4.0 ). Seems like you are running at 4.4 GHz. Please check you CPU clock freq with the CPU-Z free tool. Also, look into the correlation graph. You will see one dot blue and one dot red which are your tests. Let´s see in the RAM upgrade correct this high deviation. II'll probably run a few more tests, this time with my cranked up in-game video settings, to see what impact these SS settings have and to check out the visual quality differences to see if they make a difference. I'll also probably try running a set of tests at a lower OC level on my CPU (BoS seems to be handling it just fine, but at 5.0 I'm picking up a little extra fan noise in some of my other games that I'd rather not hear). Unfortunately, when I went in to actually view the track with my Rift headset on, I discovered that something in the Ultra setting that isn't present in the High or Balanced settings seems to be the key to eliminating/minimizing the infamous "bubble of blur" in the trees, which is the main reason I've held off flying BoS all these years and why I was so happy with the update a few months ago where they finally managed to address that thing. So, it looks like I'll have to settle for the lower FPS numbers for a while, at least until someone finds another way of addressing the blur bubble that doesn't exact such a heavy toll on FPS results. The good news is that, at least during the benchmark test track, those lower FPS numbers did not seem to cause any noticeable issues, so hopefully they'll be good enough to let me enjoy doing some serious flying in BoS finally. I tried it a long time ago, but could never get it to have any effect on the blur bubble, and then they broke it with some updates, and then it got really confusing as to exactly which file/tweaks actually work after the latest patches, so I haven't messed with it recently. If I could figure out exactly which file and settings are supposed to be working currently, I'd be happy to try it again. Also it is interesting how much FPS (or percents) can a user gain if switching to lower graphic options. I personally prefer more FPS to a nicer picture. So these settings have the biggest impact in the fps you achieve in BOS. For my rig it is a bit prohibitive to run in Ultra, therefore High is the right one for me for now. Something strange is happening here in your VR test. Your monitor results are relatively good, looking at those you should expect something more in VR, at least an avg of 60-65. As far as we have seen, VR Avg is about half of Monitor Avg, but we should take into account that all VR&monitor tests has been done with 10XX Pascal cards. I don´t know if the RAM upgrade, the CPU overclock, or the GPU upgrade will correct this anomaly. Got my RAM upgrade and I can confirm that something strange is happening for sure. Frames seemed to be limited around the 45fps mark. It's like something is limiting them from going up as I ran the monitor test and there's more performance there with the ram upgrade and also with an overclock I now have. Possible that reprojection forced on in that test? Seems odd to not go over 45 by much. Perhaps a check of the steam VR Settings? I think this is the likely culprit. Where/what should I change here to fix this in steam VR settings? The bubble of blur only seems to go away if you select Ultra/4x terrain. Yet it means you'll be using texture resolutions that are way too high to be visible, overly taxing your GPU. The terrain.cfg file is not used anymore since the last update, and thus useless. Options to customize graphic settings are strongly limited. What you guys need to get your head around, aside from all the praise you've had in the past for VR in IL-2, is that the VR implementation in IL-2 is far from being "optimal" or "very good". It is in fact average at best. I have said that in the General Discussion Thread and lined out what possibilities exist in order to improve the experience mannigfold - all I received was Flak. Like criticizing a sect. If you want to help improve things, don't you think it is better to start nagging here and there constructively, to point out what can get improved? but only chiliwili replied to it - yet even he was only supporting half of the issues I pointed out - the others ended in relativations and work-arounds. I'm not here for work-arounds. I want this game to rock in VR. 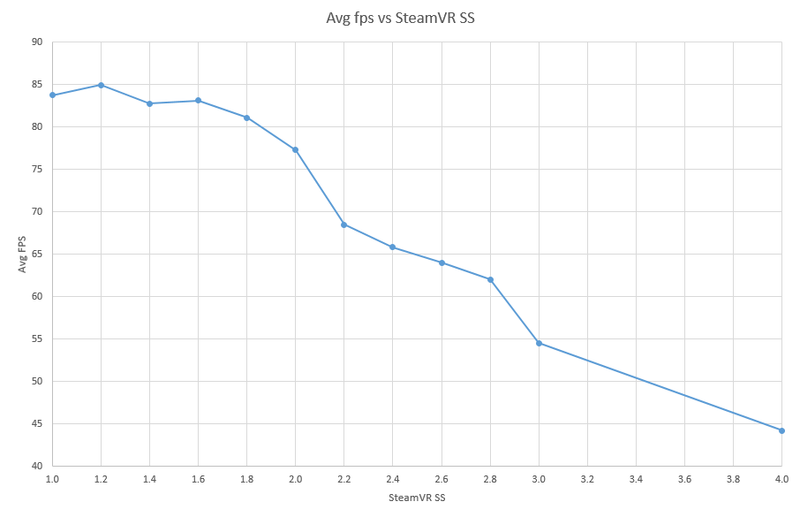 If you want to run in 4K goggles next year, you will need an engine that runs fluently on Steam's SS at 4.0 now. It's the same amount of megapixels rendered. 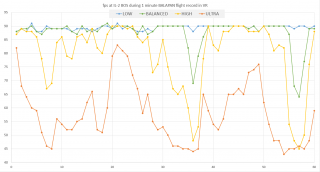 The technology to improve performance and quality mannigfold is already released - but IL-2 does not use it. In fact, Jason Williams said "we have the best VR implementation". Do you think he is right, when IL-2 does not even let you set texture resolution separately from view range, does not let you set contrast, takes a nosedive in fps with HUD/Chat active, and bugs out ASW with flashes and double vision so that everybody is used to turn it off? Have you compared the implementation of tech in IL-2 to other VR titles such as ED, EVE Valkyrie, and more? 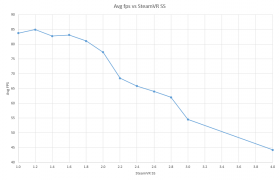 It is better to make changes to the Rift's ASW settings through the Rift software, rather than through Steam's. Steam VR's settings for this is more relative to the Vive's way of handling re-projection, which is different to Oculus. Couple ways to adjust ASW settings for the Rift. Control-Numpad1: Disables ASW and returns to the standard rendering mode. Control-Numpad2: Forces apps to 45Hz with ASW disabled. Depending on the application, you are likely to experience judder. Control-Numpad3: Forces apps to 45Hz with ASW enabled. Enabling and disabling ASW will help you see the effects of ASW. Alternatively, through the Oculus Tray Tool you can grab over on the Oculus General forums.  It is a great tool and I use it myself, I have a profile set for BoS to run with ASW off. I also use it to set my SS and to switch audio to the Rift when Oculus Home starts. One last assumption that I can only confirm after several days of long term testing (only made a single test) : An OC higher than 4.7GHz on the i7 7700K will start throttling the CPU to default 4.2GHz after ~15 minutes, probably due to the cpu's VRM heating up. This happens on almost every Z270 board, especially if you use watercooling like me. An additional fan to cool the cpu's surrounding base is required to hold this clock, if at all, so the voltage regulator doesn't kick in and pancakes the clock. So I am sorry to say, our current system to test may hold not much practical value yet, because it is too short in time! Thus, it is not even an indicator for actual held ingame performance. I know you put a lot of work into it chiliwili, and I thank you, I made the previous observations with it. But maybe we need a new secondary stress-test-track to confirm that our systems can hold the clock over time. It must run for around 15-20 minutes, and beside frames and time it must also log the core speed or voltage (regulator works by reducing voltage afaik). Then we can add an additional row at the right that says "Steadfast for 20 minutes" and put in "Confirmed"/"Throttling" for the response. So I am sorry to say, our current system to test may hold no practical value, because it is too short in time! Thus, it is not even an indicator for actual held ingame performance. I know you put a lot of work into it chiliwili, and I thank you, I made the previous observations with it. But maybe we need a new test-track and start all over again. It must run for around 15-20 minutes, and beside frames and time it must also log the core speed. I thought VRAM was on the GPU? A test 15-20min long just to point out a potential throttling issue doesn't make sense unless you're trying to fix that issue. Short tests get more systems results, and more variety in settings tested. Fixed - German to English translation. I meant VRM, of course. There is also the need to cool the base distributed around the CPU, usually beneath the little heat sinks for Z270 boards. The point is that everyone using these boards gets throttling issues with non-beheaded i7 7700Ks (I think the English people call that "delidding" or something), or when no sufficient direct cooling exists that blows on top of the CPU (typical for anyone using a water cooler). That's taking a layer off the top that touches the CPU cooler, making it thinner? I'm not game to try that, but the result is usually lower CPU temp and better cooling performance. Maybe I'm missing something else. Many thanks for reporting your results and all these interesting tests you have been doing. Yes, definitely, the RAM speed is an important factor for fps in VR. In previous tests, Radek reported a +10fps for a 867MHz RAM increase. I also had +8.3fps for a 1067MHz. Wow, this is surprinsing. I didn´t test this myself but I will do it. What is your nosie level? I mean, repeating 3 or 4 test with identical settings and see what are the differences between them. I don´t know why, sometimes my noise level is around 0.1 fps, but in other tests it is around 1 or 1.5 fps. Yeap, this is very much aligned with previous test. CPU OC is key to play BoS in VR with High/Ultra settings. You said you overclock the cache as well. I use a software tool to OC my rig (MSI Command Center) but it doesn´t have the option to increase OC in cache. I assume you do all this OC in the BIOS, right? So I am sorry to say, our current system to test may hold not much practical value yet, because it is too short in time! Thus, it is not even an indicator for actual held ingame performance. I know you put a lot of work into it chiliwili, and I thank you, I made the previous observations with it. But maybe we need a new secondary stress-test-track to confirm that our systems can hold the clock over time. It must run for around 15-20 minutes, and beside frames and time it must also log the core speed or voltage (regulator works by reducing voltage afaik). Then we can add an additional row at the right that says "Steadfast for 20 minutes" and put in "Confirmed"/"Throttling" for the response. The test procedure we (Radek and me) have been refining is just an updated version of the original Balapan track. We only wanted something quick and easy to test, so everybody can do it with not major effort. The objective of all this is to determine in an objetive way the most influencing factors to have a good experience in VR, from Hardware, Software and settings point of view. In the previous months we all have discovered many new things that we only suspected in the past, and we all have put right facts at it. Your tests has also brought interesting views. Being said that, the test procedure is far from perfect but good enough to determine those factors. This test is not an OC stress test. It is just a test to have a rough idea of the performance in VR. In IL-2 there are many planes with very different fps rates (I-16 for example use to give a high fps rate because most indicators are hidden), many places (runway vs high altitude), many effects (smoke, clouds, bullets, fire, winds, rain, etc) and many type of missions (intercept, ground attack, etc). So it is almost impossible to measure all this things. We just wanted a common pattern (short in time) to make measurements. If your rig disable the OC after 20 min, you don´t need to make a longer IL-2 VR test, you need an OC stress tools (Prime95, AIDA64, etc) to study that and see how you can avoid that. 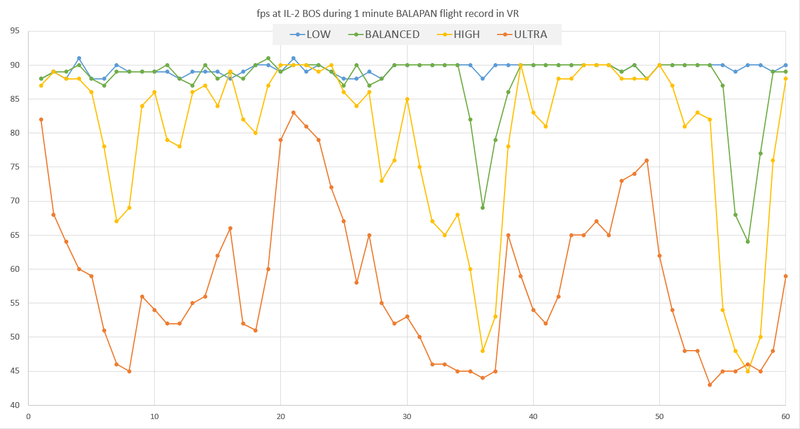 In fact, ideally, BOS could incorporate an option in the main menu title ("Run Benchmark") and run a 2-3 minutes averaged fly taking into account the most common used things. With the option to report that automatically to Devs who will know the specs of the users and their averaged fps. In RoF a few years ago (back around version 1.23, IIRC) the devs did create a set of benchmark missions for use in testing (one with combat action, one over a large town, and one just plain scenery). In the combat one, they had several other (friendly) aircraft flying nearby, balloons being shot down, etc. yes I OC in BIOS. It was also the only way to get rid of an AVX limitation @4.2GHz. I initially overclocked to 4.9 and wondered why my performance would level at 70-75fps avg. Later found out, IL-2 calls AVX and thus the clock limitations for AVX applications. My system remains stable for 25 minutes max on the current clock, then usually goes crashing. I can keep it stable at 4.7GHz. I will later increase back to 4.8GHz and see how that'll work out. I must use pre-active cooler curves to keep acceptable temps and stability, even though I am watercooling. My i7 is not delidded. Also tried turning off in steamvr settings. No frame rates over 45 in vr test. Much higher rates in menus occasionally up to 90, but all flights are below 45fps. Vr tests all 35-44 average, 21-29 min, 41-47 max. So, didn´t see the big difference you saw. Today I wanted to find out the influence in fps of the size of the screen displayed at the monitor while we play at VR. So, apparently it doesn´t affect the fps in my rig. I also made more test having other applications running at the time (like CoreTemp, or CPU-Z) and it seems they also don´t affect the fps average. I think I will run with 1600x1200 since it is using the same vertical physical resolution that the Rift and use less horizontal space than 1920x1080. As far as ASW, not real sure what might be going on there for you, it certainly should be disabling it. I also wanted to analyze in more detail where is the SS threshold for my modest 1070. I used the track of the test setting different SteamVR SS from SS=1.0 to SS=3.0 with increments of 0.2. I also tested SS=4.0 as a final test. For my humble 1070, the most practical SS would be 1.7 (it is a coincidence that it is the one used in the test procedure!) or max at 2.0, which is when the GPU is starting to be the limiting factor. For a 1080Ti this threshold is around 2.6-2.9 as reported above by Panthercules. It this graph you will see that there are to big drops in fps (when He-111 are hit and produce a lot of smoke/fuel trail). It doesn´t matter the SS you put. Here the CPU is bottleneck and responsible for the min fps number. Therefore, the Balanced&Low settings also should influence in the complexity of the smoke or damage model. Could Fraps itself be the issue? I found this post suggesting that fraps may only be reporting the windowed frame rate? Have you confirmed that forced interleaved reprojection is not enabled in steamvr settings? I think it is under the developer tab? If not check performance or general tabs. I am away from my VR PC at the moment so I can't look and state the exact menu option. I have seen that your monitor fps have increased a bit with respect the reported before. Is this due to the memory upgrade? Did you use the procedure test for this or it is in normal game? You already did a clean install and your grey SteamVR screen went away, but it seems you have a new problem then. It is clear that it is not a CPU/RAM performance problem since your passmark number is good and your monitor results are good as well. So, it is something related only to VR. - Try sensors at 1meter, 2 meters and 3 meters. Doing all calibration in SteamVR. - Disable G-sync if your monitor have this. - Lastly, if you have a friend with a 10xx pascal card, borrow it and try it. Apologies if I missed reading something earlier in this thread about your rig. According to your sig you are running a gtx970? I had one as well when I first got the rift, and it will run il2 without that grey screen flicker you were having earlier, but not with a large margin. Only reaching 90 fps when most of the render is an an empty sky. 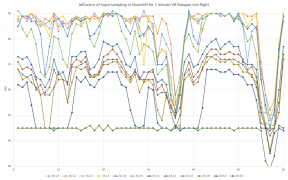 The VR test uses an ss of 1.7 at "high" settings. This is too high for a Gtx 970 to reach 90fps in VR. Your monitor test only shows that pancake mode puts less of a load on the Gpu than VR does. Try monitoring your Gpu load in Gpu-z during playback of that track. It should be at a solid 99% load throughout. Or even better grab a friends 1070-1080ti just to try. Fenris. Sorry to hear about those heat issues though I'm sure you'll get things sorted. I think somethings not right as I don't recognize the problems you are experiencing with the 7700k. What water cooler is it your using? And at what core voltage are you at? Psu? For reference, (this was a while ago so I don't remember the exact numbers) I recall even small fft stress test in prime 95 didn't push temps on any core above 80-85. While any other continuous task gave considerably lower temps. Mine is not delidded and at 4.8ghz. Using a twin fan d15 air cooler. 1.7 seems to actually work ok in VR for some reason. I fee like good CPU and good RAM can perhaps overcome some of the issues of not having a 980ti, 1070/80/ti series GPU as it seems like il2 does a good job of spreading everything around the system. Would love to try one out, but will just start saving for my own. I reapplied thermal compound and fixed vcore to 1.35V @ 4.9GHz now, cache at 4.4GHz. I think it was the cache at x45 that led to crashes. Or the LLC setting - I fixed it to lvl 1 now to keep a more steady voltage (thus fluctuates strongly even with fixed voltage when on automatic). Edit: Froze again after 25 minutes of heavy combat over Stalingrad on Wings. Will stay at 1.32V @ Core 4.8GHz Cache 4.4GHz now. The heat wasn't a real issue, i7 7700k is expected to spike to 85-90℃ and go back down in seconds according to Intel, I'm at 75 Max now, so it's no problem. The vrm goes to around 55℃ iirc, but is steady. Just was used to older chips who'd roast at these temperatures. Now the thing runs fine at *4.8GHz and heats the room. Playing on ultra@3.2ss , with the gtx1080 being the bottleneck. I will OC that one as well today.